Crowdfunding has become an essential way to fund innovative startups worldwide since the Financial Crisis. It has democratized the capital formation process by taking funding away from banks and traditional capitalists and putting it into the hands of people who support those businesses as a donor or investor. Some years ago it was the first of the financial services to move online, and as finance continues to move online, we’ll soon look back at funding an startup on the web as commonplace. New laws are bringing the early stage venture capital markets online, and with them we will see more inclusive models that change the landscape of who invests. We reached out to some of the top influencers on our list to ask them for their views on crowdfunding. We spoke to Kendall Almerico (#1), Chance Barnett (#8), Oscar Williams-Grut (#10), Robert Hoskins (#11), Mike Quindazzi (#25), Tony Zerucha (#29), Tricia Meyer (#34) and Samuel Guzik (#43). Be sure to follow them to stay up to date on the best content and resources on crowdfunding. Robert Hoskins – Director of Media Relations / Crowdfunding PR Campaign Manager at Front Page Public Relations, Inc.
Tricia Meyer – Managing Attorney at Meyer Law Ltd. 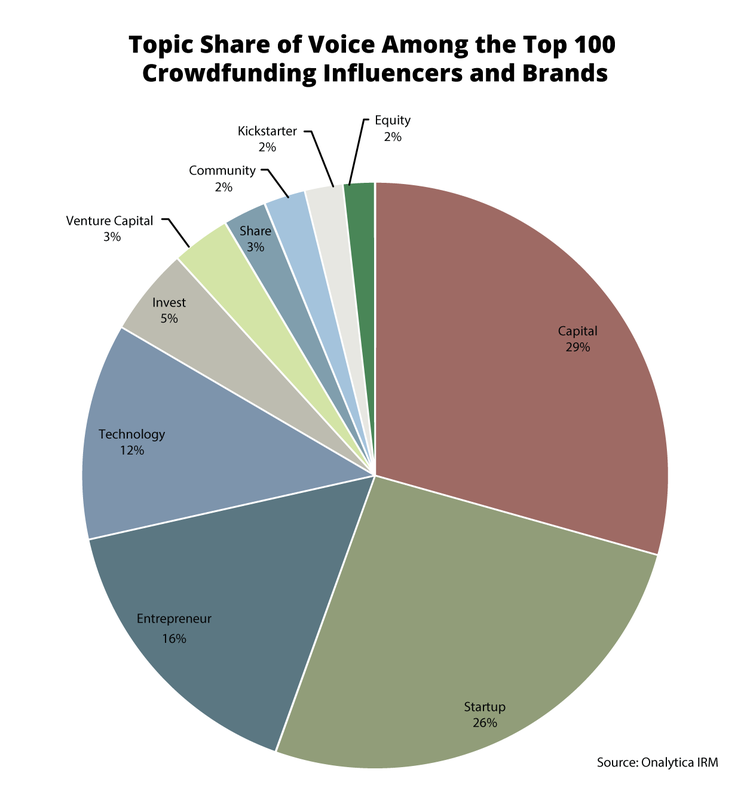 The most popular topic mentioned in tweets and blogs by the top crowdfunding influencers by a long way was Capital with a 29% share of voice, illustrating the massive importance of raising capital within the crowdfunding space. Startup was the 2nd most popular topic with 26% of all topic mentions among the top crowdfunding influencers and brands, proving how innovative small companies are of paramount importance in the crowdfunding market. The 3rd most popular topic was Entrepreneur with a 16% share of voice, whilst the topic of Technology received 12% share of voice, followed by Invest with a 5%. Venture Capital and Share received a 3% of the mentions followed. The topics Equity, Community and the brand Kickstarter received a 2% of the mentions among the top 100 crowdfunding influencers and brands. We were very interested in seeing which brand and individuals were leading the discussion around crowdfunding, so we analysed over 53K tweets mentioning the key words: ((crowdfunding OR crowdfund) AND platform) AND NOT (SME OR SMB OR Policy OR Regulation OR Entrepreneur OR Entrepreneurs OR Entrepreneurship OR Fintech OR innovation OR Startup OR Startups) from the 20th August – 20th October 2016. We then identified the top 100 most influential brands and individuals leading the discussion on Twitter. What we discovered was a very engaged community, with much discussion between individuals and brands. Below you can see a network map of the online conversation with number one individual Kendall Almerico at the centre. This map was created with our Influencer Relationship Management software (IRM). Be sure to click on the map to enjoy the full size network diagram in greater detail. 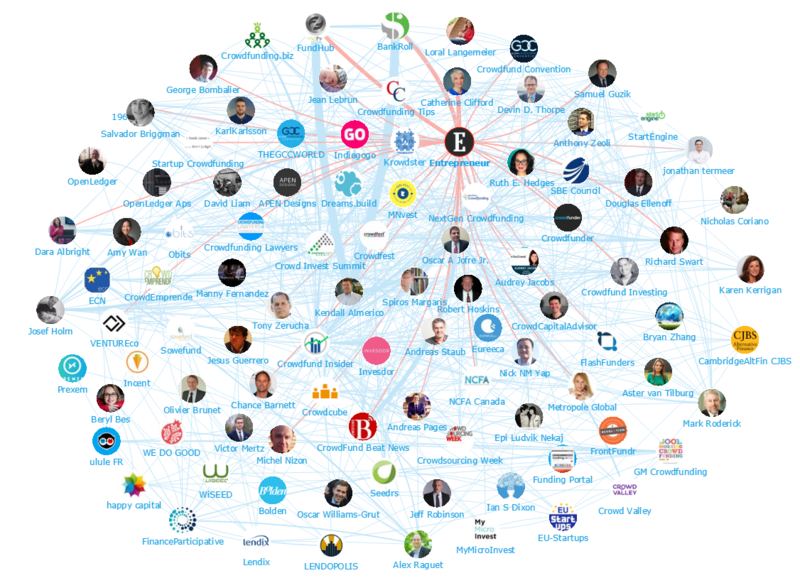 Below you can see another network map created with our Influencer Relationship Management software (IRM) showing Entrepreneur at the centre and all the conversations to and from the influencers in their field. If you are interested in learning more about identifying, managing and engaging with influencers click here to get in touch! 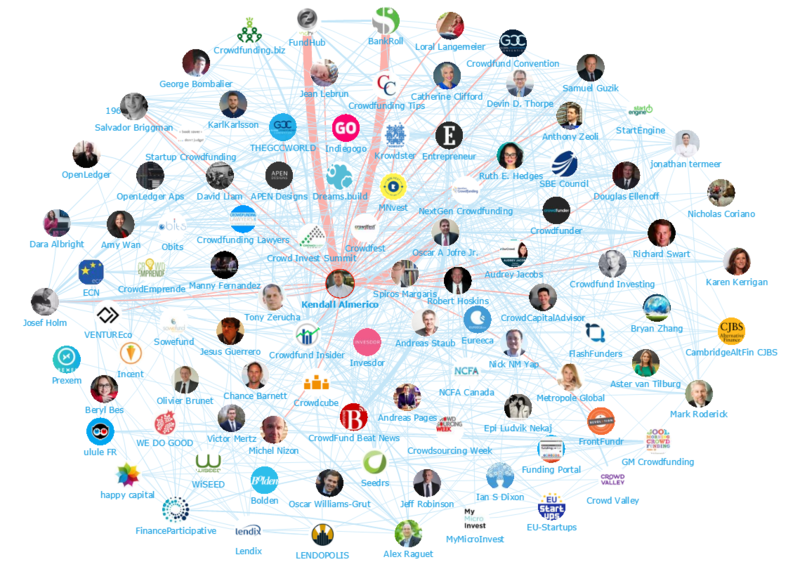 We looked at all the individuals engaging on Twitter to bring you a list of the top influencers in crowdfunding. Below is the top 50, if you want to see who ranks from 50-100 be sure to download the full report by clicking the download button below. We also looked at all the brands engaging on Twitter to bring you a list of the top brands talking about crowdfunding. 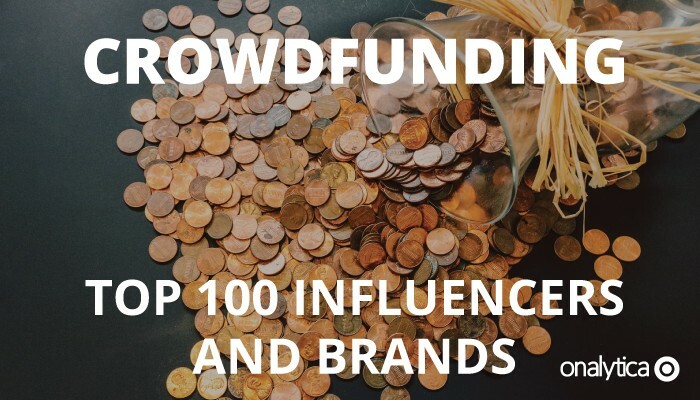 Below is the top 50, if you want to see who ranks from 50-100 be sure to download the report to get the full top 100 list, and see who are most the influential brands in crowdfunding.